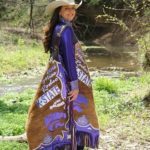 Brooke Wallace, the 2016 Miss Rodeo Kansas State Rodeo Queen, has a specially designed pair of chaps representing K-State and the Abilene rodeo. Photo by Amber Thompson. Abilene, Kan. (July 11, 2016) – It was watching the rodeo queens from the stands at the Abilene rodeo that made Brooke Wallace want to be one of them. And now the New Cambria, Kan. cowgirl is the 2016 Miss Rodeo Kansas State University. Wallace, who is 21 years old, will be a senior at K-State this fall, majoring in apparel and textile design. As a youngster, growing up in Dickinson County, she attended the rodeo with her parents, Mark and the late Julie Wallace, and watched the rodeo queens as they rode by on horseback in glamorous outfits. “I’d love to have the job they have,” she told herself. Wallace was two years old when her dad led her, on horseback, through the show horse arena. She has shown horses in the Eastern Kansas Horseman’s Association since her youth, and graduated from Solomon High School in 2013. It was in high school she discovered her artistic bent. She made a dress out of pop cans, then, for her junior prom, she made a duct tape dress, complete with ruffles, using 57 rolls of tape. She also made a suit for her date, so they would match. She loves doing anything creative, including painting, sewing and wood burning. She’s currently painting designs on shirt sleeves and jeans for a cowgirl competing in a National Little Britches Rodeo queen pageant. Wallace has also competed in K-State’s Showcase of Excellence, a contest for artistic exhibits which is judged. She had a blouse and slacks accepted into the show her freshman year, which got sixth place. Her sophomore year, she got third place for a dress made out of plastic grocery sacks, fused together with an iron, and last year, she won best of show with a dress made of leather for her rodeo pageant. This summer, she’s been on the road nearly every weekend, representing K-State at rodeos across the state. She’ll be in Abilene for the Wild Bill Hickok Rodeo August 3-6, riding in the grand entry each night, the parade on August 4, and signing autographs after each night of rodeo. And there just might be another little girl, sitting in the stands, watching Wallace ride by in her flashy clothes, and dreaming of being a rodeo queen. Abilene rodeo tickets are $10 in advance and $13 at the gate. Children ages four through ten are $7. They can be purchased online at CKFF.net and at various local retailers, including Astra Bank, First Bank of Kansas, Great Plains Federal Credit Union, Pinnacle Bank, Solomon State Bank, and West’s Plaza Country Mart. For more information, visit the rodeo’s website at WildBillHickokRodeo.com or call the fairgrounds office at 785.263.4570.